China 5000 years different indeed. No one denies that, but many times companies come to China and do not know what those differences entail. Before I started my own company, I worked for a company that helped US companies start factories in China. We had a matrix of many factors in helping the customer decide which city, site and zone to invest in. However, if we drove past a McDonald’s on the way to one and just drove past Chinese places on the way to other, the matrix would be affected. All 10 items like nearness to suppliers and cost would all be rated higher at the McDonald’s location. It happened often enough I called it the McDonald’s effect. You may note I write about being afraid of the right thing, because I see that we are blindly afraid. The picture at the top is of music in China. Instead of using a bar with lines and spaces, it uses numbers to represent the notes. Then it uses underlining to represent half or quarter notes. You can sing any song by this method. Yes, China was mostly separate from the West for 5000 years of its written history. They do everything a different way. No real opening to the West occurred until 1978 when Deng Xiao Ping became leader of China. 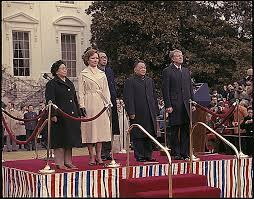 A shocking image is Deng Xiao Ping and his wife at the White house in January 1979. It is an unprecedented opening. However, Deng Xiao Ping knew that 5000 years of Great Wall thinking could not be worn away in a few weeks. I know a Westerner that hired a guy out of college and ten years later had him managing most of the country only to find out he had been stealing from the company and the customers all way. Further he had been teaching the whole organization to do likewise. China is so much different than the West that we do not pick up the clues we think we do. Bad hires learn how to manipulate us. As we try to find our way, we do not want to attack Chinese hires because they are different. They sense our gaps and many people will jump in and take advantage. We do need to jump in and understand Chinese people. The culture is opaque, but worth the effort to understand. Finally, we need to guard the door better than we would in the West. Make all effort to find hires who will be transparent and help us be clear rather than opaque and happy we are in the dark.